Most familiar with Greek mythology know of Dionysus (Roman: Bacchus), the infamous god of wine and spiritual host of spring festivals and celebrations everywhere. Lesser known is the figure of Silenus, immortal tutor, advisor and companion to Dionysus—and all things considered, much more fun. Mask of Silenus (1st C., Roman). Vienna Museum of Art. 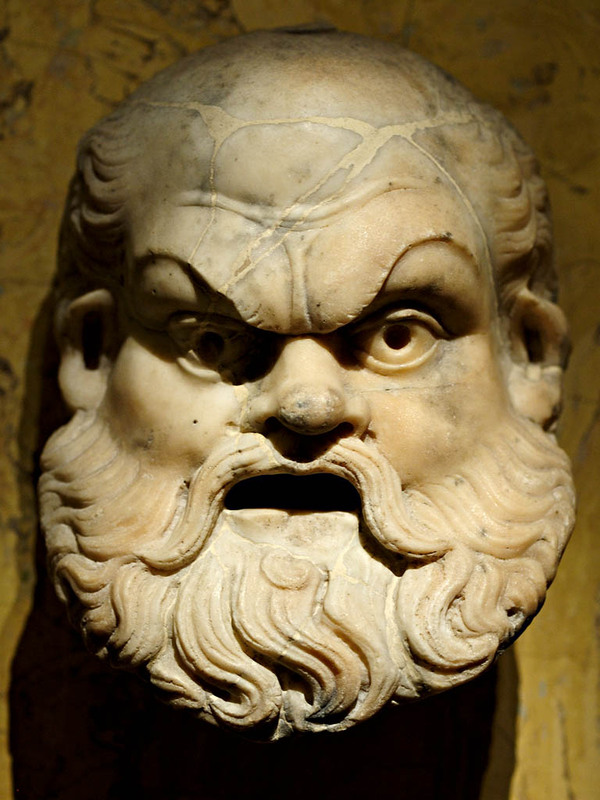 Silenus was the god of drunkenness and merrymaking, and was a character in several classical Greek dramas. Said to be father of the satyrs (those half-man, half-goat creatures perpetually chasing woodland nymphs), Silenus is generally depicted as fat, balding, often naked and so inebriated that he rides a donkey rather than stumbling about. He spends his days pursuing wine and a good party, and taught Dionysus everything he knows about music, dance and drink. Rather than being regarded as a simpleton or fool, Silenus was revered by the ancient Greeks for his great age, storytelling and wisdom as a mentor to the gods. His counsel was sought by the legendary Phrygian King Midas, and it was Silenus that granted his wish-curse of the golden touch. It was also said that when he became intoxicated, Silenus acquired the gift of prophesy and could foretell the future. These stories are not meant as a glorification of reckless drunkenness but rather the joyous merrymaking and fleeting happiness sought through drink during man’s all-too-brief lifespan. The wisdom of Silenus is quoted as, “That the best thing for a man is not to be born, and if already born, to die as soon as possible.” Our lives viewed by the gods are but for a day, and our great tragedy is that we are aware of this fact. The focus in these pages is more on modern craft beer and its rising industry (a personal preference over the grape) but a good burgundy, single-malt, mead or mezcal will not be ignored. Experience holds the spotlight rather than product reviews or journalism, although elements of both will persist.